The flight routes of passenger aircrafts are generally well established. In practice, unforeseen factors, mainly related to the weather, often force pilots to cover more kilometres than anticipated. A Polish-Colombian team of scientists and engineers, inspired by the behaviour of insects and birds, has developed software that allows real-time rational modification of flight routes. As a result, it was possible to achieve measurable savings, both financial and with regard to environmental protection. Verified by millions of years of evolution, the characteristics of the world's wildlife have often served as inspiration for scientists. This was also the case for the scientists and engineers from the Institute of Physical Chemistry of the Polish Academy of Sciences (IPC PAS) in Warsaw and Universidad Cooperativa de Colombia (UCC). The team decided to use their interdisciplinary knowledge to optimize the flight routes of aircrafts. The aim was to reduce greenhouse gas emissions, reduce noise pollution and reduce operating costs. The task was carried out using algorithms reflecting the characteristic features of the behaviour of bees and cuckoos. "In Warsaw, we deal mainly with catalysis. Recently, it has turned out that methods inspired by solutions found in nature can be applied in the analysis of catalytic issues," explains Prof. Juan Carlos Colmenares, of the IPC PAS. "We were interested to see if we could use our knowledge to optimize fuel combustion in aircraft engines. With our partners from Colombia, we started work with one module, but the programme rapidly began to grow to include more, taking into account other factors affecting flight patterns." In development for three years, the software has been prepared in terms of setting optimal flight paths for short-range aircraft equipped with turbo-fan engines with a constant combustion volume. Within this group, each type of aircraft is represented by an appropriate set of parameters. In the future, researchers plan to expand the software with algorithms and data taking into account the specific characteristics of aircraft with engines of other types. The software already incorporates a whole range of parameters, related not only to the type of fuel used, engine performance or aerodynamics, but also to the originally assumed flight paths, climbing and descent profiles, length of airport runways and local topography. Chemical and noise emission modules deal with optimization of the impact on the environment. The package meets the safety standards imposed by the International Civil Aviation Organization (ICAO). The heart of the software is two algorithms for finding potential flight paths. The basic algorithm uses principles seen in nature in the movement of groups of animals, especially in schools of fish or swarms of bees. Each individual in the group decides on the next movement based on the knowledge acquired to date of the best places visited by him and other individuals of the group, he also takes into account the inertia of his movement. In the package optimizing flight paths, the 'bees' are various points around the aircraft, each of them being treated as a separate individual penetrating the area. The algorithm begins working from a swarm of points moving around the plane. In the next iterations of the algorithm, the 'bees' begin to cluster around the optimal place at a given moment and this is considered the next stage of the flight path. The second algorithm for searching for the next stage of the flight imitates the behaviour of the cuckoo, the bird laying its eggs in other birds' nests. Flight paths designed using the cuckoo algorithm are characterized by long and straight sections, violently turning 90 degrees. "The great advantage of the software we have developed is the fact that it works in real time. As a result, the flight controller and the pilot receive hints on a regular basis. Not only can they make a decision quickly but also consciously, once choosing a slightly more risky route, but one that is more economical, at other times opting for a maximally safe route, but taking a little longer," emphasizes Prof. Colmenares. 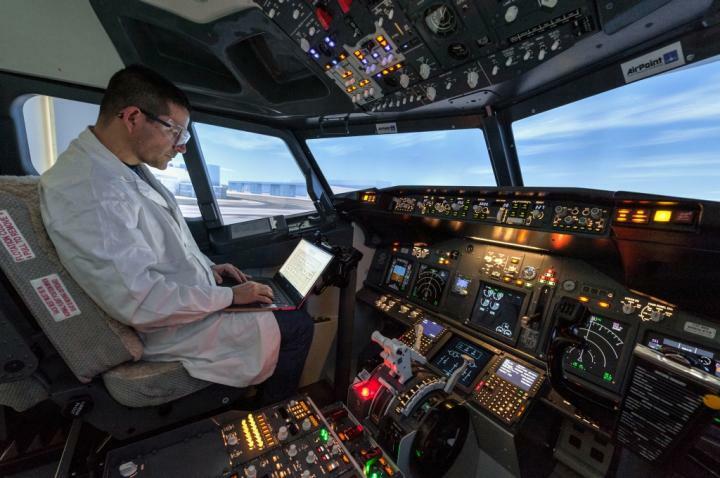 In order to test the software, the researchers analyzed the effectiveness of its predictions with regard to the popular Airbus A320 aircraft with CFM56-5 engines, serving routes of around 350 km with typical flight parameters (cruising speed 828 km/h, 39,370 feet, etc.). The simulations show that in unconventional situations, the routes proposed by the software were, on average, about 11 km shorter than the typical alternative ones, delineated in the classic manner on the basis of the flight plan. Ultimately, the optimization allowed the total operating costs of one machine to be reduced by 1.16%. "Profit at a level not much larger than one percent does not look particularly great. Our simulations show, however, that in the case of a single but often used aircraft, the savings over a year can reach even hundreds of thousands of dollars. And yet we are only just beginning to expand our software and it is not yet fully optimized! So, in the future, we can expect slightly higher savings than those currently forecast… but we should not expect miracles", says Dr. Eng. Ramón Fernando Colmenares-Quintero, Prof. UCC. In the coming years, the individual parts of the package optimizing the routes of flights will be improved, and the package itself will be expanded with new modules. Polish-Colombian research on the issues described here is financed by the Universidad Cooperativa de Colombia (project no. 1510) with the support of the Colombian Instituto Tecnológico Metropolitano.